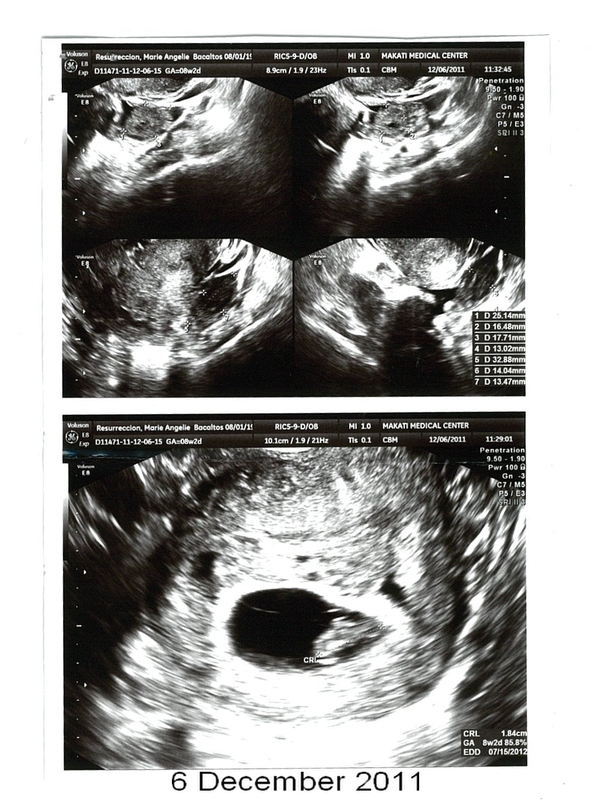 I had to take another ultrasound on last December 19 to check on the hemorrhage. Jan was unable to make it because we had a bit of miscommunication. It was too bad because the form of the baby was much clearer. And it was great seeing its little finger nubs moving about. I also got to hear the heartbeat! Such music to the ears. As for the hemorrhage, it was a little bigger. When the doctor checked, however, she said she was not as concerned as before because it seemed that the bleeding did not affect the baby. The baby was actually growing at a good rate. She did ask me if I wanted to have further bed rest. For that week, I said I needed to get back to work, but I would gladly take it for the next couple of weeks. So officially, I am on bed rest again. But I can be a little more mobile now. Yey! I was scheduled to have the standard battery of tests to be taken on December 19. I thought it was just your typical time at the laboratory where they extract your blood and use the vial taken to be tested. Well, my thoughts were correct. What I failed to realize that for each test, they need a vial of blood. I only had to have seven tests. Frak. The worst thing about it was I had very thin capillaries. Every time I have blood tests, the nurses would often exclaim about extracting my blood is a challenge. So when I had my tests, I had to be pricked several times. One prick would just yield two and a half vials. They had to take from the other arm since my veins collapsed. Both arms ended up taking a beating. Boy, was it painful. I don't usually hurt from needles, but with the amount of blood they needed to take, it really hurt. The most stressful test was the glucose 75 which was to measure the sugar in the blood. For that I had to fast. I was already so hungry by 9AM. We got to the hospital around 9.30AM, only to find out that I left the doctor's instructions for the tests. Jan had to go back to the condo to get it. He got back to the hospital at 10.15AM. By the time it was my turn, it was quarter to 11. When they got my blood, they had to extract one particular vial for my blood sugar after fasting. Then I had to drink this bottle full of glucose that was disgustingly sweet. Ugh. Then they had to take more blood samples an hour after and two hours after. Which meant, I could not eat until they got the third extract. Whuh? I was so faint with hunger already! Plus I had to run to my ultrasound upstairs. The wait for that took too long. By the time they took my ultrasound, I was late for my one-hour after extraction. The secretary of my doctor also called me up to tell me that the doctor would be unavailable because she had to conduct a delivery, so we had to reschedule on Wednesday. By the time my last extraction happened, I was absolutely dizzy with hunger! I thought I could eat a horse after, but I was also so faint, I could only eat a little. I actually over ordered, but the good thing is, I had extra for merienda. Hehe! The ultrasound showed us that our baby was doing well with 164 heartbeats per minute. Definitely a good heartbeat. It was something to be thankful for. To be honest, I had to hold back telling most people because I've heard a few horror stories of pregnancies around the first trimester. It was a relief and a joy to see the baby having a healthy heart. Ultrasounds do reveal other things. It showed that I had something called "subchorionic hemorrhage." The doctor explained that there was minimal bleeding in my uterus. It was like wet glue that did not stick that well yet, so we had to be careful. She wanted to be overly cautious and adviced some bed rest for me. There was nothing to be really worried about, but since it was the most sensitive stage of pregnancy, it was best to take extra precaution. So rest I did. And it was needed to be honest. I was always sleepy. And even if I was just sitting down, I felt tired most of the time. I felt nauseous most of the time and would occasionally vomit. So it was good that I listened because the past few days have been uncomfortable. Because I was hormonal, I snapped at one point because... of lumpy pillows! But after getting back to my fluffy pillows, there was a huge difference on how rested I felt! 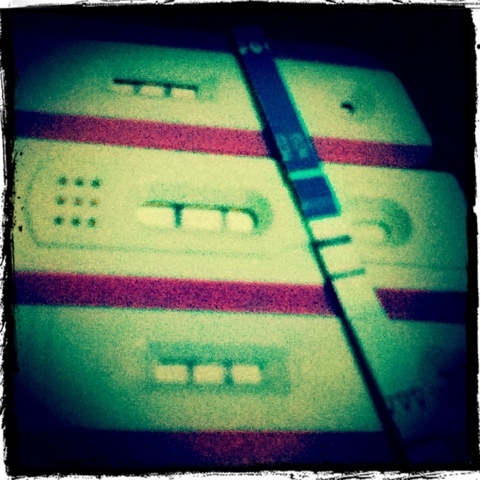 If I have to be behaved and well-mannered and prim just to make sure the baby has a safe journey in my tummy, will do! I was pretty excited to finally have my ultrasound. If there was something to see the moment we found out, I would have gotten that ultrasound immediately. But of course, we had to wait for me to reach eight weeks to make sure there was something to see. 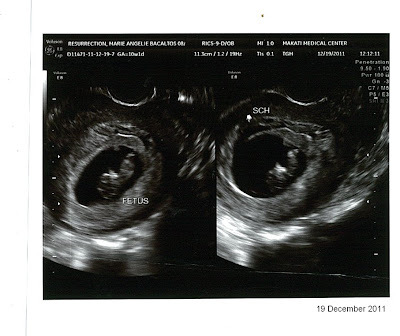 There are no words to describe the excitement of seeing the vague form of your child. Seeing the heartbeat gave me goosebumps! There's not much to see, but already s/he is beautiful. It was truly a special day for Jan and I. It was on this day that we confirmed that I was pregnant. With four home tests. At around one in the morning. Because I could not help but want to be absolutely sure.